When I first started my blog I wanted it to not only be a place to share our families adventures and battles but also a place that could educate, raise awareness and hopefully help others that are unfortunate to have to go through these things too. I love to write about our lives, the ups and downs, I love to share every part of life that makes it what it is, but I love the most when I can share Poppy and her story. Whether I blogged or not my kids and our family would continue to make memories and write the chapters of our life, but Poppy’s chapter was only small and for it to continue it will by me, her mother sharing it and sharing her memory. 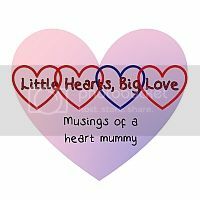 If you read my post the other day you will be aware that this week is CHD awareness week and for this Louise over at “Little hearts, Big Love” asked me to write a guest post and share our story of Poppy and her CHD diagnosis in helping to raise awareness of CHD for “CHD awareness week” (too many CHD’s?) of course I was very much into it and even a little excited to be writing as a guest for someone else. Our story is a painful one – yes it has moments of joy, being pregnant, seeing wriggles on scans and then seeing a perfect baby girl, but the ending is always the same , you can share the good points but its always a sad story in the end and not many want you to share. Despite the pain I like to share it, I like to know others are reading of my daughter, learning of the journey some families have to take. I was very pleased she asked me to share it. When I read Louise’s blog and of her gorgeous girl Jessica it takes me back to our diagnosis at 20 weeks and her life is how I imagined ours would be with being told our daughter had congenital heart disease and like them hypoplastic left heart, we learnt of all of the surgeries, we imagined our little girl with her scars. Unfortunately as you see with the reality of our story CHD can also be a killer and many (not just ours) children and babies die from this condition. So if you would like to read my guest post just click HERE and I hope you enjoy (as much as you can) reading a more detailed post of our experience with CHD. Thanks for letting me 🙂 Your doing amazing at raising awareness of CHD – Great heart mummy!